Just back from a party thrown by Slingbox, the company that links your TV to the Internet for remote viewing. The bash was originally intended to celebrate the launch of new models (faster streaming, more inputs, HD compatibility, that sort of thing), but also served to mark the acquisition of Slingbox by EchoStar (a US satellite TV company). Just back from a party thrown by Slingbox, the company that links your TV to the Internet for remote viewing. The bash was originally intended to celebrate the launch of new models (faster streaming, more inputs, HD compatibility, that sort of thing), but also served to mark the acquisition of Slingbox by EchoStar (a US satellite TV company). As EchoStar may itself be bought by AT&T, this is an interesting path for the company to walk. I've used Slingbox a bit - a friend has one linked to his Sky+ system, and I borrow the feed sometimes when I'm abroad - and it's a good product. It's particularly effective over mobile phones, where you can watch everything you can at home for the cost of the data; take that, UK mobile phone TV systems (those of you who survive). Of course, the very idea that you can watch your own TV when you're elsewhere has the copyright captains in a lather (we won't even go into the sin of letting a pal sneak a peak) - but the squawks of indignation are having little effect, as nobody else gives a stuff. So, go Slingbox! On a more corporeal level, the party was marked by Japanese beer, some very respectable wine, a prize draw where I didn't win a Slingbox (but one small group of analysts won two - chiz chiz), and the usual suite of tiny nibbles. They were very acceptable canapes, born aloft on square white china by personable young black-dressed people on square white china, but as usual they were under an inch square apiece (the canapes, not the people) and only intensive browsing could sate the inner man. You might think from my picture that I have a particularly insatiable inner man, but believe me, size zeros would have been doing impressions of hummingbirds at the flower this evening. One of the nibbles was a tiny square of brown bread with even tinier squares of peppers, feta cheese and some unidentified root vegetable. The whole assembly was roughly cubic and layered, and it reminded me of something so strongly I had to stare at it for a couple of seconds before Kirin-fuelled hunger overcame my higher instincts. 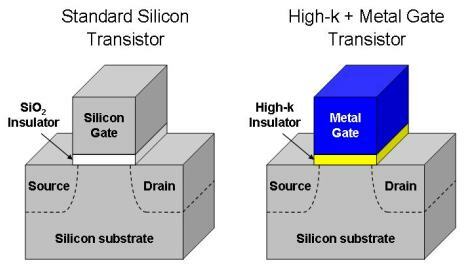 As the tiny thing vanished down my gullet faster than a grain of millet swallowed by a starving mongoose, it hit me - Intel's transistor diagrams. And what an opportunity that could be: demonstrate the new high-K dielectric transistor by throwing a party where every nibble is designed to represent a semiconductor device. Battenburg for multicore, pizza for an entire wafer - olives placed to within the nanometre - and perhaps we dare venture into the passives, with capacitor sandwiches, chocolate fudge resistors and onion ring spiral inductors. Those more possessed by intellectual savoir-faire than brute hunger could construct entire circuits, lashed together by spaghetti or liquorice string according to taste. The downside is, as always, Gordon Moore. Every party would see the food vanish twice as fast while being all the more tiny. Even though he was a man who knew how to party in his younger days - the early years of Silicon Valley are replete with stories every bit as toothsome as those of the dot com bubble - his influence must nevertheless be resisted when it comes to refuelling the noble company of journalists. But still. Let's see a bit of flair back in the geek party circuit.